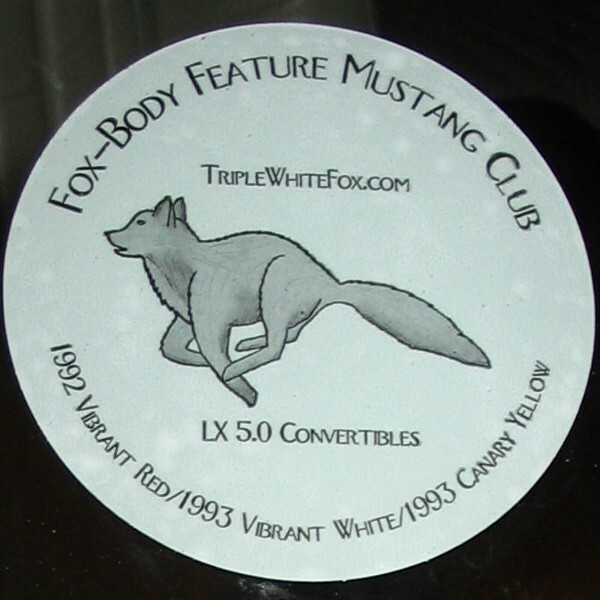 Support you favorite fox-body Mustang site by purchasing the official sticker of the Fox-Body Feature Mustang Club from TripleWhiteFox.com. Let everyone know you are a member of this community! 3" in diameter. This will cling to the inside of your windshield. It is cling and not adhesive so it will probably not be advisable to put this on your side windows. NOTE: These have been kicking around for a few years and the last few I put on didn't stick via static. I needed to apply some moisture (aka, spit) to the back in order to get it to stick. For this reason, I have reduced the cost only to cover the paypal fees essentially making them free except for the stamp. Shipping via first class mail.